Scoping is about understanding the "big picture" and understanding a project’s limits. 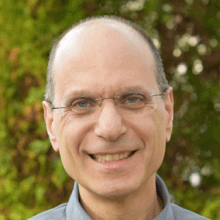 My observation as a Business Analyst at Mediacurrent is that because project teams don't have unlimited time and money, it's important that all stakeholders understand clearly – and visually – where a project's boundaries are. Scoping ensures we, as your agency partner, know what needs to be included to deliver on the business goals and objectives within time and budget constraints. Actors that will be impacted the project. They can be people or systems. People can include project stakeholders, an organization’s customers, personnel, and more. A Context DFD is best used before the project begins, so all stakeholders and agency personnel have the same understanding of the project’s boundaries, the external actors that do and do not interact with the solution being built, and the data flows that exist between the external actors and the solution. This serves as a good starting point for detailed requirements elicitation and analysis. The organization Acme Seminars has scheduled a new seminar and has advertised it in the SMS, which reaches out to prospective attendees via the web. A new attendee registers for the seminar through the SMS web interface. Part of the registration process is entering credit card information. The SMS sends the credit card information to the credit card company’s Approvals server, and gets a message back that the credit card was approved. 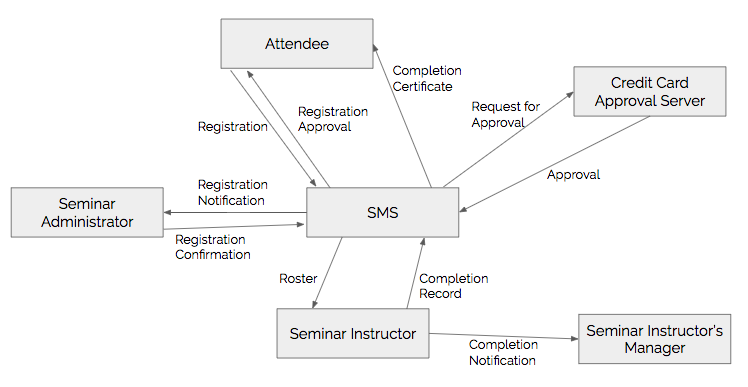 The SMS notifies Acme’s Seminar Administrator by email of the new registration. 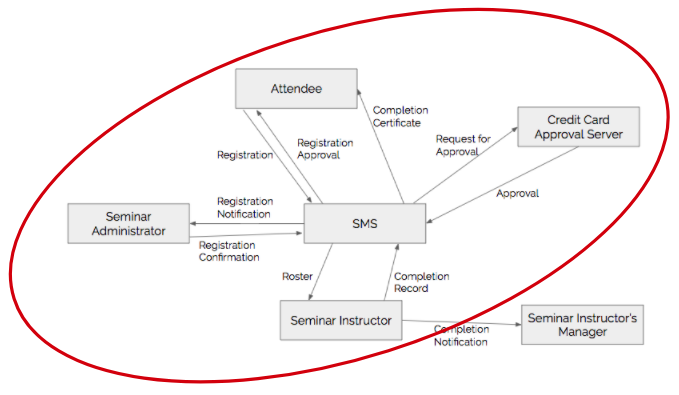 The Seminar Administrator logs in to the SMS to view the application, and confirms the registration in the SMS, which then sends a confirmation email to the attendee. A day before the seminar, the SMS sends the Seminar Instructor a roster of the attendees. The Seminar Instructor takes attendance at the seminar. After the seminar is complete, the Seminar Instructor goes into the SMS and marks each attendee’s record as complete, if they were in attendance. The SMS sends an automatic email to each of those attendees with a certificate of completion. The Seminar Instructor also notifies her manager by email that she has completed teaching the seminar. A data flow is a conduit in which data or information flows. It involves the usage by one or more actors, and is identified both by the data being carried and the (always) one direction in which it flows. Data flow arrows are named with a brief description of the type of information being carried. These brief descriptions should always be a noun or a noun phrase. Using our example, we draw a rectangle for each of the actors and connect them with unidirectional arrows signifying the data flows. If data flows both ways between any two actors, create two separate arrows. 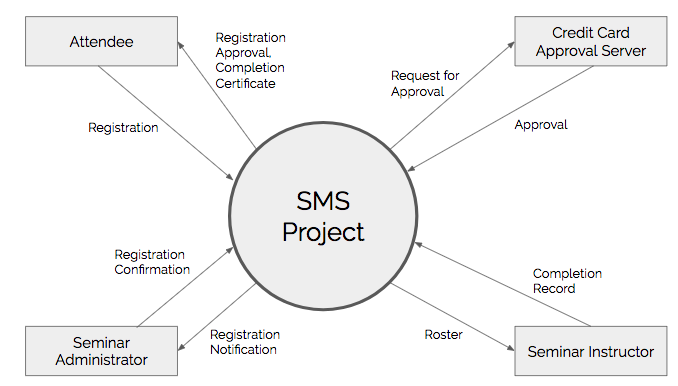 We also consider the SMS itself as an actor. Next, we lead the stakeholders in reaching consensus about what actors and data flows get included in the project and which don’t. Certainly, budget and schedule play a big role in this decision, but utility also plays a role. That is, consider whether it’s really useful for an actor or data flow to be part of the project. Draw a circle around the actors and data flows that stakeholders agree should be part of the project. 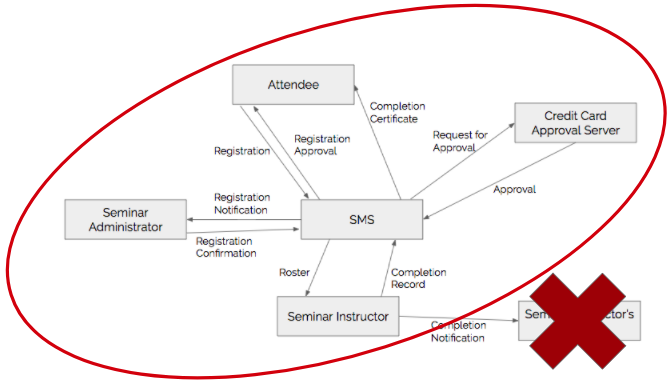 In our example, we draw a circle around everything except the completion notification to the Seminar Instructor’s manager, which doesn’t have much utility for the solution the stakeholders have in mind. Consider any actor or data flow that is outside the circle as out of the scope of the project, and can be removed. Now the project’s high-level boundaries are clear for all to see. This diagram further serves as a starting point for more detailed requirements documents, including functional decompositions, entity relationships, a use case model, and much more. If you’d like to learn more about this and other requirements management tools for your organization, please contact us. At Mediacurrent, we've invested in Data and Business Analytics personnel and processes to make digital transformation a reality for our clients. We’re happy to chat with you!